In a new survey by the Institute of Advanced Motorists (IAM), nearly one in 10 admitted to taking a selfie while driving. 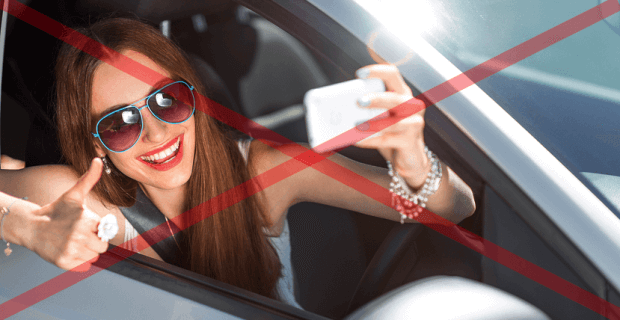 The age group most likely to take a selfie behind the wheel was 25-35 year olds, with 19% saying they had participated in this worrying trend. Drivers aged 18-24 came second highest at 15%. This seems to go hand in hand with the popularity of social media among younger people, with many posting the selfies onto social media websites such as Twitter and Instagram. Why is taking a selfie at the wheel so dangerous? A previous study by the IAM has indicated that using a phone at the wheel is actually more dangerous than drink or drug driving. This is because using a phone causes drivers to have much slower reaction times, difficulty staying in the same lane and makes them less able to adapt to even slowly changing circumstances. Who do you think is more likely to take a selfie behind the wheel: men or women? The study found that men were twice as likely to take a selfie while driving, with 12% having admitted to doing so in the last month compared with only 5% of women. But that’s not all. With the capabilities of technology increasing, the distraction that smartphones can cause has amplified. In the past, road safety campaigns focused on preventing drivers making calls or texting at the wheel, whereas phones can now be used to make video calls, use social media and browse the internet. Usage of newer technology, such as tablets and Smart watches, while driving is also likely to increase as they become more popular. For example in the IAM’s study, 8% of drivers said they had used FaceTime or Skype while driving, 7% had recorded video footage of themselves and 18% had accessed the internet on their phone or tablet. How can we stop this trend? IAM’s chief executive officer, Sarah Sillars highlights that “Safe driving is everyone’s responsibility and more must be done to catch drivers using these devices dangerously by increasing the fines and points for smartphone and tablet use at the wheel – there is simply no excuse. Campaigns must also be introduced that raise awareness of the prevalence of the issue in society and make this behaviour socially unacceptable as drink-driving”. Campaigns such as My Red Thumb aim to discourage drivers from using their phone behind the wheel. By painting your thumb red, you can help spread awareness of the issue and show your support. But does this go far enough? It seems a cultural shift is what is needed here to change attitudes towards drivers using their phone at the wheel. However as smartphones, tablets and other gadgets are still relatively new, it may be some time before we see this behaviour becoming socially unacceptable. What else can be done? Share your views in the comment box below.